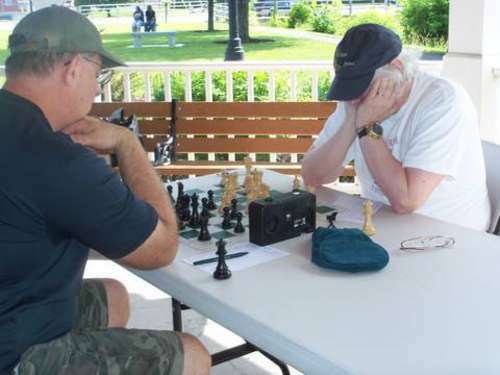 07.21.12 Roger Morin won the seven-player 2012 Maine Potato Blossom Festival Chess Tournament played outdoors in Fort Fairfield, Maine on July 14th, 2012 with a score of 4.0 points. Todd Snyder and Lance Beloungie finished second and third with scores of 3.0 and 2.0 points respectively. 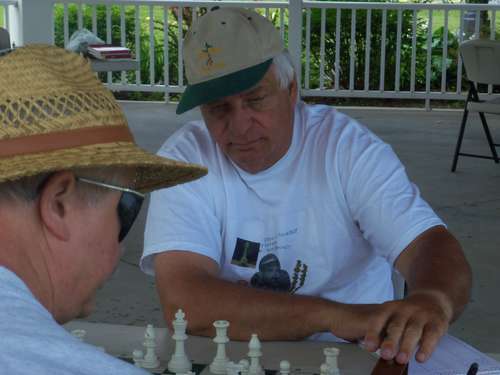 Here are photos and the USCF crosstable of the event. 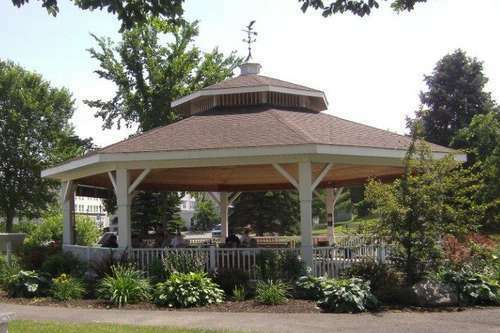 The Gazebo at the Fort Fairfield Potato Blossom Festival was the site of the 2012 Potato Blossom Festival Chess Tournament. Taking first at this tournament Roger Morin's rating went to 2024--congratulations Roger. Todd Snyder put up 3.0 points his only loss being to Morin. Lance Beloungie scored 2.0 points and pushed his rating over 1800. Ray Haines and Roger Hardison rounded out the crosstable in the open section. In the reserve section Tim Walker and Lois Morin played two games with the balance (1.5) going to Walker. Ray Haines made the event possible through his local contacts and involvement with the Maine Potato Blossom Festival Committee who graciously donated a $500 prize fund. Caribou's newest assistant tournament director Lance Beloungie took care of the pairings. Thanks to Nancy Beloungie for providing the photos. Tournament winner Roger Morin (facing camera) plays Todd Snyder in round 3. Lance Beloungie (left) tangles with Todd Snyder during the first round. Roger Hardison during his game with Ray Haines. Lance Beloungie is a picture of concentration during his game with Todd Snyder. Young and experienced came out for some off-hand games at the festival.